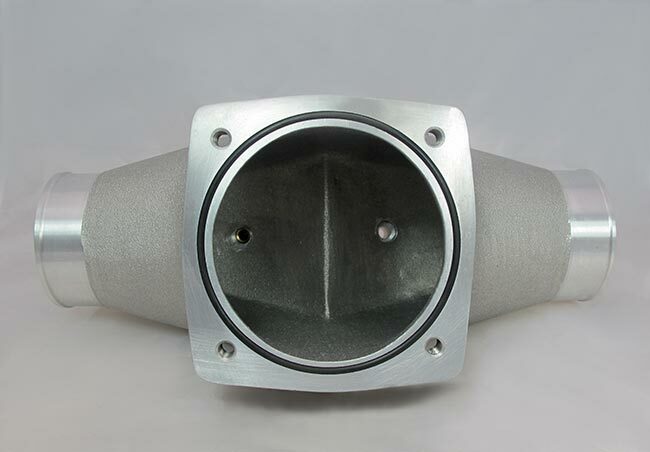 If you are looking for that single performance item to make a night and day difference in your Porsche 997.1 911 then this IPD Plenum is the product for you! The new 997.2 IPD Turbo Plenum was considerably more difficult to design and develop than previous Plenums. The good news is that all these efforts have yielded a much easier installation process than previous Turbo Plenums. 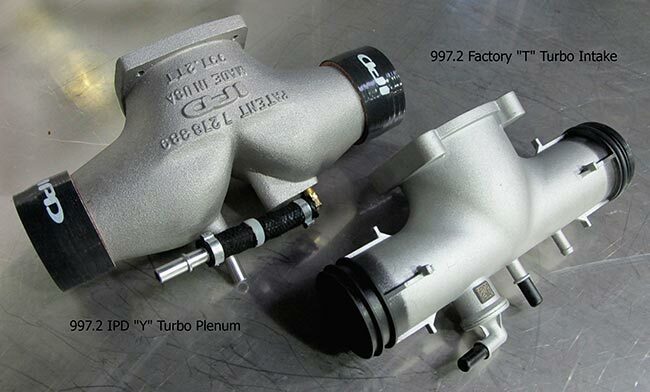 The new IPD Turbo Plenum is offered in one single 74mm version which utilizes the factory 74mm throttle body. The 997.2 Turbo intake manifolds are smaller than the 997.1 Turbo manifolds which is great for improved boost response and gas mileage but less than ideal for making substantial power gains. The 74mm TB provides more than adequate flow for these more restrictive intake runners eliminating the need for a larger 82mm "Competition" version. 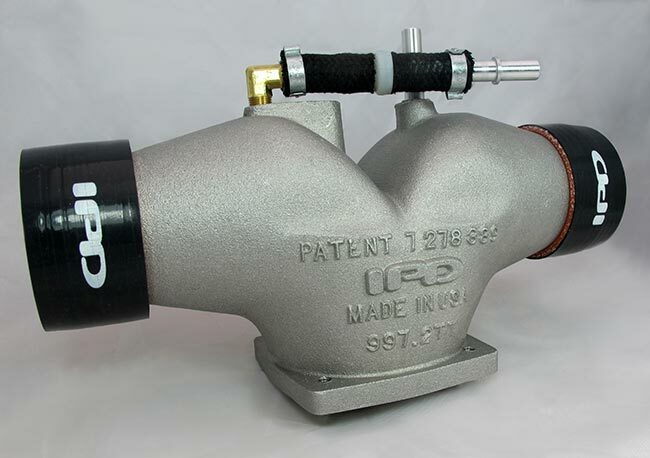 If you are looking for that single performance item to make a night and day difference in your Porsche 997.2 turbo then this IPD Plenum is the product for you! Professional installation highly recommended for the Porsche 911 Turbos. Installation for the Turbo 911 Turbos requires anywhere from 2 - 5 hours to install, depending on its location. The 997 Turbo requires an “adaptation” period that can be fully realized with either a series of hard pulls on the dyno or 10 to 50 miles of hard driving which of course IPD recommends only be performed on a closed circuit race track. 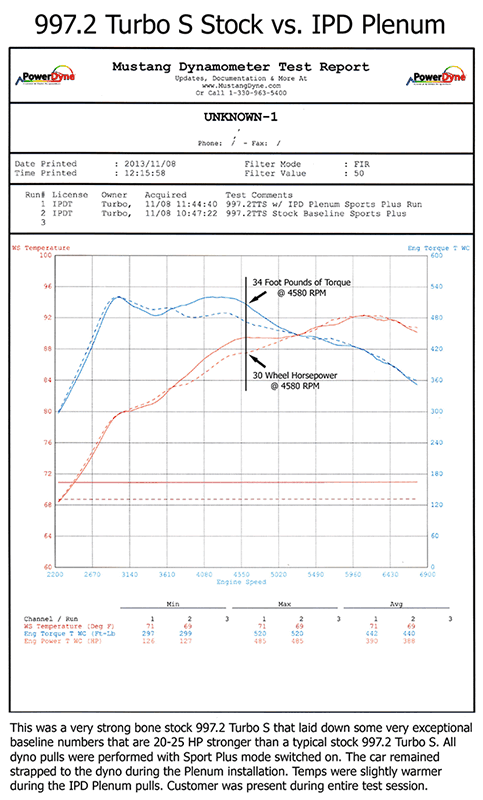 If you can't believe the gains, take a look at the DYNO's below for the official DYNO sheets!!! Genuine 997 GT3 82mm Porsche Throttle Body NOT REQUIRED!! NOTE: LARGER THROTTLE BODY NO LONGER NEEDED! 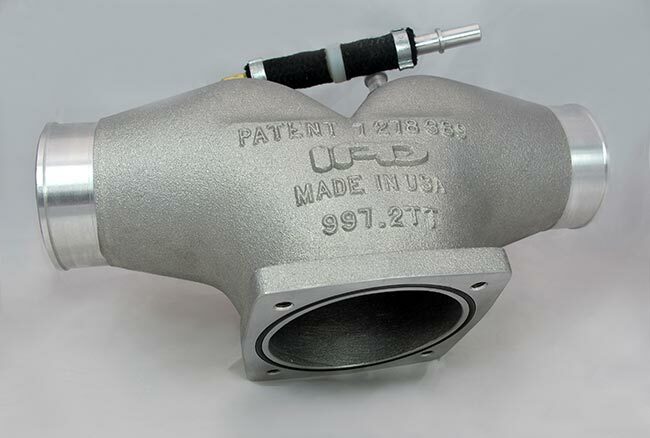 Whereas 997.1 required a competition throttle body, This version of the 997.2 Turbo plenum utilizes the factory 74mm throttle body and delivers impressive performance gains throughout both horsepower and torque curves for both stock and modified Turbos.